Non-linear systems are complex because a change in one component can propagate through the system to lead to surprising and apparently disproportionate effect elsewhere, e.g. the famous “butterfly effect”…. Connectedness measures how one action can affect other elements of a system. A simple example of connectedness is the effect of a failure of one critical node on the hub-and-spoke network of airlines. Dynamic systems also emerge from the actions and feedback of interacting components…. The definition you use depends on the purpose to which you want to apply complexity. For finance, several of these measures of complexity come into play. There are non-linearities due to derivatives. Connectedness comes from at least two sources: the web of counterparties and common exposures. Exacerbating all of these is the speed with which decisions must be made. Bookstaber stressed that the most important step in taming systemic risk was to reduce excessive interconnectedness. Not only did it need to be done, it needed to be done first because trying to reduce risk in a tightly-coupled system will typically backfire, and we cited examples of precisely this sort of result in early 2008. And the authorities ignored this issue as the crisis was underway. For instance, the reason Bear was rescued rather than allowed to fail was almost certainly concern over its credit default swaps exposures. But did the Fed and Treasury go into overdrive, and start gathering better data from US financial firms and press UK and European regulators to do the same to try to get a handle on the issue? No. They went into “mission accomplished” mode. And there’s been perilous little interest in addressing the problem of interconnectedness after the crisis. Yes, some activities are being moved to centralized clearing. Yet as this post explains, only recently has the Fed started capturing and publishing data on interconnectedness. While this is a welcome step, why has it been so slow in coming? At the onset of the global financial crisis, many financial institutions that engaged in risky practices were on the verge of bankruptcy as the housing market crashed. Top regulators soon discovered that shocks suffered by large banks spread quickly throughout the financial system and then to the whole economy. Those large firms, colloquially dubbed “too big to fail,” were also highly interconnected. Jane D’Arista, James Crotty, and a few other economists had identified these inter-connections, but most economists and policy makers had remained clueless. Tackling the scourge of systemically dangerous financial firms requires a theoretical and empirical understanding of their evolution and dynamics. But before the Great Recession, only a few academics analyzed situations in which market participants were of similar sizes and they found that interbank deposits could act as primary channels for liquidity shocks (Allen, Franklin, Gale). Some other scholars concluded that interbank credit extensions could result in banks that were “too interconnected to fail” (Freixas, Parigi, Rochet). Recent academic research suggests that this may lead to the exacerbation of externalities. Further post-crisis studies considered sectors or market systems that did not have equal-sized participants. They concluded that shocks to the most interconnected banks spread widely across the financial system (Gai, Haldane, Kapadia) and that large interbank exposures were linked with systemic risk(Cont, Moussa, Santos). While some progress has been made on understanding theoretical linkages, prior to the crisis, data collection and action by the relevant regulators lagged behind. Some recent estimates of intra-financial lending have tried to fill this gap. But these estimates have had to rely on sectoral, not bank level, data and can therefore be, at best, “guesstimates” of the interconnections (Montecino, Epstein, Levina ). In a step forward, the Dodd-Frank financial reform bill passed in 2010 created a special designation for “systemically important financial firms” and directed the regulators, especially the Federal Reserve, to strengthen their information gathering and regulatory focus with respect to these firms. Now, late to the game, regulators such as the Basel Committee on Banking Supervision (BCBS) have sought to identify certain characteristics that determine an institution’s level of systemic importance, and interconnectedness is one of them (Federal Reserve, BIS).And finally, the Federal Reserve has begun collecting and disseminating data on the contributions of large financial institutions—dubbed “globally systemically important banks” (G-SIB)—to systemic risk. An important feature of this new FR Y-15 report is the measurement of intra-financial activities via the “Interconnectedness Indicators” in Schedule B and the data collected is similar to BCBS’s assessment of global systemic risk. The FR Y-15 report is accessible on the National Information Center’s website and covers holding companies (banks and Savings & Loans) with total assets of $50 billion or more as of June 30 of the reporting year. Of the 39 holding companies listed as having total assets of greater than $50 billion, 33 banks filed the report, with AIG, GE Capital, Teachers Insurance and Annuity Association, Charles Schwab, State Farm Mutual, and United Services as exceptions. This new data source gives us an unprecedented level of detail on intra-financial links and other aspects of systemic risk. These data suggest that high levels of intra-financial assets are held by the very largest banks. Other banks appear to hold relatively low levels of intra-financial assets. In fact, 26 of the 33 institutions in question held relatively low amounts of intra-financial assets that ranged from 1.5 to 44 billion dollars. But seven of the largest banks held very large amounts of intra-financial assets and therefore are also the most interconnected. These seven institutions—J.P. Morgan, Citigroup, Bank of America, Wells Fargo, Goldman Sachs, Morgan Stanley, Bank of New York Mellon—have become household names in the narrative of the financial crisis and bailout. These data give an unprecedented picture on their intra-financial connections. 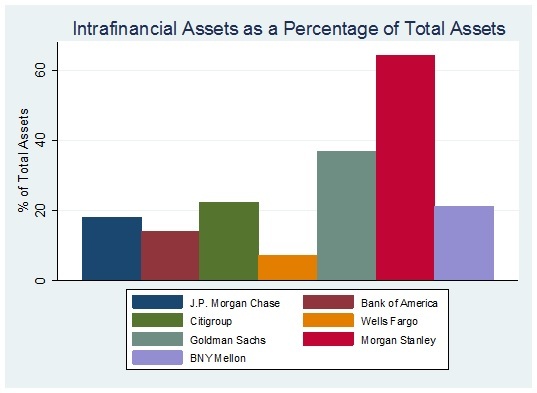 The figure below shows, using intra-financial assets as a share of each bank’s total assets, the most interconnected banks. The figures range from 10% of total assets to a whopping 65% by Morgan Stanley; almost 40% of Goldman Sachs’ assets were intra-financial assets. These reported data on the intra-financial lending of the largest banks are roughly in line with the estimates based on macro data made by Montecino, Epstein and Levina, who found that intra-financial assets on average comprised about 25% of total assets in the 2000’s (Montecino, Epstein, Levina). These data, though, are based on detailed bank level data and show that some banks, for instance Morgan Stanley, have truly astounding levels of intra-financial assets. These highly detailed data allow us to drill down and look at specific intra-financial assets. A closer look at the data reveal, for example, that a significant portion of intra-financial assets held by institutions are in the form of Over the Counter (OTC) derivatives associated with unaffiliated third party firms. In fact, amongst the largest banks, OTC derivatives constitute between 6% and 27% of intra-financial assets. Some doubt that more transparency and information such as contained in this new data set will do much to diminish the dangers arising from interconnectedness. But, in fact, there are already provisions in law requiring the regulators to use data such as these to limit dangerous levels of intra-financial exposures. As Jane D’Arista has emphasized, sections 609, 610 and 611 of the Dodd-Frank Act require the implementation of restrictions on various kinds of credit exposures to other financial institutions. The Volcker Rule, which limits proprietary trading, can also help. Yet, as with much of Dodd-Frank, the strength of the implementation and enforcement of these provisions remains questionable due to the opposition of banks and the connivance of legislators. Other structural solutions have been proposed. For example, breaking up the too big and too interconnected to fail banks is a popular suggestion. To be sure, better information on these dangers is not sufficient to solve these problems. The key now is to use the information to implement the necessary changes, starting with strictly enforcing the laws that are on the books. If proper measures are not undertaken to curb interconnectedness, it is possible that another unmitigated financial disaster is in the offing. This entry was posted in Derivatives, Doomsday scenarios, Federal Reserve, Guest Post, Risk and risk management on July 15, 2014 by Yves Smith. I am always pleased when an economics post mentions Richard Bookstaber’s A Demon of Our Own Design and his concept of tight coupling. His reference to the “butterfly effect” (look it up in Wikipedia for a good definition) is the simplest example of the consequences of initial value variations in non-linear deterministic mathematics. There is no way that the problem you are discussing can be considered in that category. Interconnectedness in TBTF is non-deterministic and even if it were, the boundary values are time dependent and this complication has never been solved by anyone so far as I can determine. The Federal Reserve said Monday the transaction involving the requests by Goldman Sachs and Morgan Stanley to become bank holding companies may be done immediately, [waiving] a five-day antitrust waiting period. By becoming bank holding companies, Goldman Sachs and Morgan Stanley would have permanent access to the discount window. Well isn’t that wonderful: free zero-percent money for risk-taking investment banks. And even more wonderful, a government-sponsored moat against smaller investment banks who don’t get free money and a safety net. KACHING! Hear! Hear! The next crisis will do it. It is coming. And of course those two investment “banks” have the highest levels of intra-financial assets. But that’s okay; Lehman Brothers and Bear Stearns didn’t have any problems, now did they? Derivatives will blow the World up again. It is not a question of if but when. ALL derivatives are backed by nothing and have Zero value, and transfer the risk of loss to the consumer, a fact proven by TARP, the foreclosure and unemployment crisis, and the permanent slowing of GNP. That is what I think will happen as a result of the crazy TTIP fracking deal. A chain reaction of horrible things for American business and Americans. Now there’s a novel thought. Too bad the DOJ is so tightly copulated with the TBTJ banks. Even worse: untethered, tightly coupled global economy meets tightly coupled global ecology. What could go wrong? Late in coming as you say but I think it’s good to be having this discussion. We have achieved some stress inoculation and maybe can handle it better next time. “”Fed policymakers neglected to notice that Bagehot already had examined this argument and had shown that interconnectedness of debtor-creditor relationships and the associated danger of systemic failure constituted no good reason to bail out insolvent firms. Modern bailout critics take Bagehot one step further, contending that insolvent firms should be allowed to fail and go through receivership, recapitalization, and reorganization. Also I think it’s useful to look more closely at this statement. I think that thinking of government money as ‘the public purse’ rather than ‘taxpayer funds’ is useful in making policy choices. The government decided to create money to credit to the failing banks’ accounts. It does the same thing for defense spending. It can do the same thing for single payer medical care, extended social security, K-16 public education or a job guarantee if it thought these to be useful pursuits. Personally, I have viewed interconnectedness as a key implementation factor in the looting. If everyone is dirty, if everyone needs everyone else, then no one can be held accountable – and no disruption is possible from small actors outside the establishment. It’s that soft corruption of careerism that runs rampant across the upper echelons of all our institutions – finance, media, law, academia, healthcare, etc. – that keeps everyone in line. It’s why the authoritarians love public-private mutants. They’re private enough for personal looting by the educated technocratic elite yet public enough to be supported by the government. The fact that neither the obvious leftist solution – nationalization – nor the obvious rightist solution – bankruptcy – has been pursued demonstrates conclusively to me that we’re not discussing difference of opinion or ideology. It’s just a crime spree, plain and simple. As Jim points out above, the major financial firms today aren’t even really ‘banks’. It’s the best of all possible worlds: they are able to make money walk on water, with gigantic total leverage that has generated fabulous amounts of profits paid out to legalized-schmegalized criminals all held aloft by explicit Fed or Treasury policy and the now-widely accepted, weary sort of resigned view among the general public that the Government will simply bail them all out again, and ‘what can you do?’. Which of course guarantees another round. where’s teddy roosevelt when you need him? at the bare minimum, each of the megabanks absolutely needs to be split-up a la 1984-Ma Bell. You’d think that this idea would get more traction amongst lawmakers as cities like LA, Chicago, Atlanta, Dallas would regain the financial jobs that have been sucked into NYC/NJ by the megabanks. Oh wait, the Democratic Party revolves around what HR Clinton and Chuck Schumer wants while the Republicans just take their money and run. What about UBS, DB, BNP, HSBC, and Barclays? These are all more interconnected and systemically risky than Wells, probably. Maybe not though, Wells has something like 35% of the home mortgage market, in the US at least. Or any president, period. All we’ve got in the oval office is wall street’s water carrier. Even the otherwise venal GW Bush Administration prosecuted Enron, WorldCom, and Arthur Andersen. Clearly, none of those prosecutions would have occurred under the Obama/Banana Holder Regime. I’m not an expert on political history, but the impression I got on Teddy Roosevelt was that the republican machine never really wanted him anywhere near the white house, but they needed someone who could go head to head with “the great commoner” the populist democratic candidate William Jennings Bryan. McKinley may have been the republican candidate, but it was Roosevelt that did the campaigning. The whole episode is an argument against voting for the lesser of two evils, as it shows that even if you don’t win, making a strong stand can force the other side to shift in response. Since there is no anti-ogliarch candidate even remotely in the works, there is no reason for them to even seriously pretend to be on the side of the american people anymore. The failure to respond to critical weaknesses resulting from system interconnectedness in the financial system is replicated across the entire spectrum of large-scale human activities. So much so that I’m not sure I even buy that the Fed is only now becoming aware of the intra-financial risks outlined here, as opposed to it being perfectly aware, but intent on allowing banks maximum freedom to create system risk in their own interests. Systems, how they relate, how they magnify or diminish each other, how with each new layer of complexity the prospect of outcomes not anticipated rises, and so on, have been the object of study for a very long time – economics, engineering, cities, skyscrapers, the military-industrial complex, justice and the law, communications networks, biological, an airplane, corporations, the weather, the environment, the Internet, pretty much everywhere you look. For decades now, many of the most serious thinkers have raised the alarm over one or other system threat – the entire environmental movement is a response to such warnings vis a vis how human systems have impacted natural systems. As we all know, such alarms have mostly been ignored, almost entirely due to the efforts of powerful interests to prevent effective responses. On the opposite end of the spectrum in terms of size and seriousness of response, the ‘War on Terror’ to a significant degree involved ‘securing’ a host of systems of all kinds and combinations from possible attack. Nobody needs to be told what happens to someone who thinks he/she can walk into a ‘restricted’ area. Yet the threat from terror is nothing compared to the threat from another financial fiasco in terms of impacts including deaths, let alone the existential threat posed by environmental collapse. Many, many people anticipated the financial crisis of 2007-2009, yet the Fed, publicly at least, to this day maintains it was not aware of the seriousness of the crisis until it was too late to forestall. Even if one accepts this (I don’t – the biggest banks essentially are the Fed) for the Fed, after the worst financial crisis in post-War history, to only now ‘learn’ that the biggest banks are inseparable in a new and threatening fashion to me just reeks of the same ‘Who knew?’ as last time – except this time they at least identified a problem (and not necessarily the problem that will trigger the next crisis) though so late into the business cycle of a this anemic recovery and preposterous asset balloon as to be ‘inoperable’, i.e., TBTF mutated to Godzilla proportions. The Fed has to know this. I’d go so far as to say this is the strategy. Since just about everyone (a few holdouts like me here and there) believes there was no option other than that pursued by the Fed to prevent the ‘freeze up’ of the financial system, that is, to ‘do whatever it takes’, it surely will not come as a surprise to anyone when it does ‘whatever it takes’ again. Of course, given the blank cheque the entire US leadership elite gave the Fed last time, and the fact there’s a great deal we still don’t know re it’s actions then, there’s no reason to suppose something so mundane as the Law or the public interest would prevent it from doing things previously thought entirely verboten. There are plenty of people who think the Fed already intervenes in stocks and bonds. Why couldn’t the Fed have ‘off-balance sheet’ transactions? Why not, if breaking the Law is OK in a “crisis”, just create whatever digital money is required to, say, stop a collapse in the giga-derivatives markets? Perhaps what ought to be studied is what sort of financial crisis would be impossible for a completely unobstructed Fed to resolve? Oh, and I have a different bone to pick re the concept of the ‘butterfly effect’ – I just don’t go for the real-world analogy, which relates a butterfly’s wing movements to a hurricane many weeks later, because for every butterfly, there is a rhino fart, or whale breach, a 747 taking off, or giant tree felled, a target droned, or a billion other butterflies.